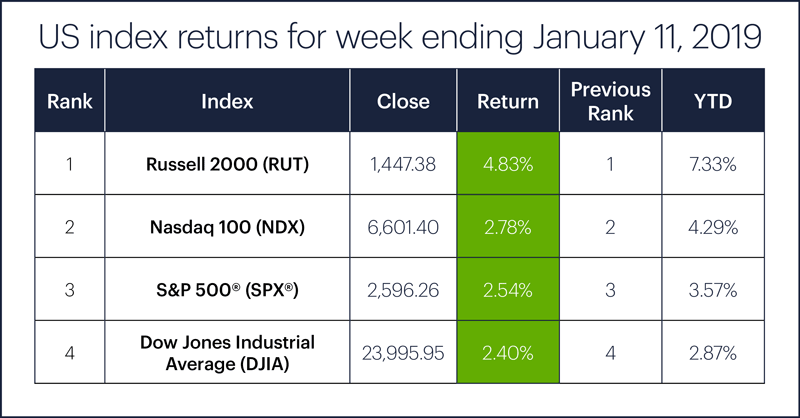 Despite a government shutdown stalemate, another inconclusive trade summit, and worries about a Chinese economic slowdown, the US stock market is coming off of a third-consecutive up week, with the S&P 500 (SPX) just missing its first six-day win streak in almost a year because of Friday’s fractionally lower close. The market got off to another good start last Monday amid optimism about the latest US-China trade talks (which ended, as have others, without much in the way of tangible progress) and a continued rebound in crude oil. 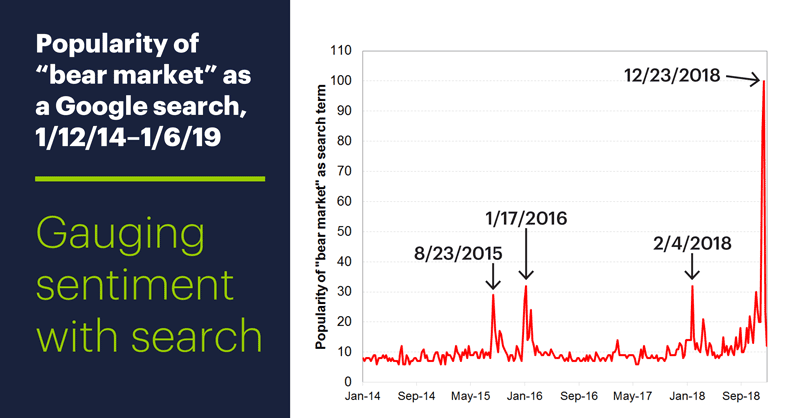 But the week’s news highlight may have been Wednesday’s FOMC minutes release, which reaffirmed that several committee members felt the Fed could “afford to be patient” about hiking interest rates1–potentially hopeful news for bulls worried about higher rates pressuring stocks. 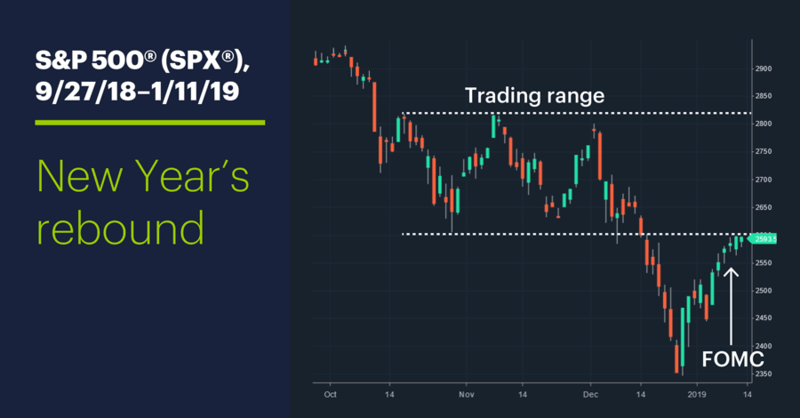 The SPX followed through with another up day on Thursday, but hit the pause button on Friday as it (along with other indexes, as well as crude oil) approached the resistance represented by its late-2018 trading range. Sector action: Last week was green across the board. The top-performing S&P 500 sectors were industrials (+4.1%), real estate (+3.9%), and consumer discretionary (+3.7%). The worst-performing sectors were consumer staples (+0.6%), utilities (+0.8%), and financials (+1%). Highlight reel: On Monday, California utility provider PG&E Corp. (PCG) tanked more than 20% on rumors it may consider filing for bankruptcy amid potential losses from the California wildfires.2 Tactile Systems Technology (TCMD) jumped as much as 26% on Tuesday after releasing moonshot preliminary full-year performance figures. On Thursday, Macy’s (M) tumbled 18%—it’s worst day ever—after releasing sub-par holiday sales numbers and a gloomy outlook.3 On the same day, small-cap biopharma stock Amarin (AMRN) jumped 22% on buyout chatter. Futures watch: Friday’s 1.7% downturn broke February WTI crude oil’s (CLG9) run of eight consecutive up days, but the market still ended the week with a $3 gain and a close above $51.50/barrel. February gold (GCG9) spent the week in a holding pattern, consolidating between $1,280–$1,310/ounce and ending the week around $1,290. Those already checking out an SPX chart on Power E*TRADE may notice that, in addition to the fact that these previous “bear market” search highs occurred around significant market lows, in each case the SPX pulled back to test those lows before ultimately moving higher. 1 Bloomberg.com. Fed Minutes Reveal Caution on Rates Missing From Statement. 1/9/19. 2 Reuters: California utility PG&E explores bankruptcy filing: sources. 1/4/19. 3 CNN.com: Macy's stock has its worst day in history. 1/10/19.